This is just a test to see how malleable the Cortex Command setting that I'm working on is. The (sometimes loose) inspiration here is System Shock, an early FPS-RPG. The crew initially consists of humans and robots. 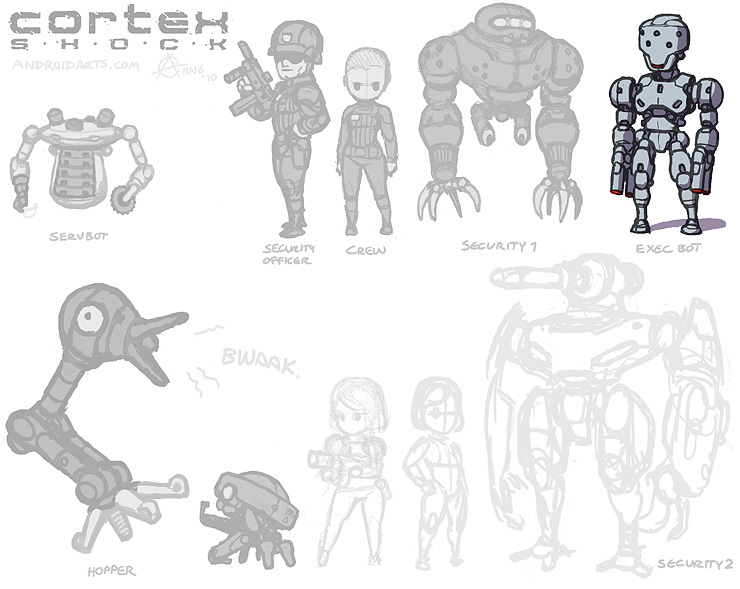 System Shock inspiration: Servbot, Security 1 bot, Execbot, Hopper, Security 2 bot. Generation 1 - Half of the crew fall victim to a horrible virus, transforming them into aggressive mutants. Many die in the tumult which arises. A few surviving mutants still roam the corridors, making strange sounds, repeating phrases. Generation 2 - With the surviving crew locked out of vital systems, they begin to lose the battle when a new type of hostile abomination appears - the cyborgs. 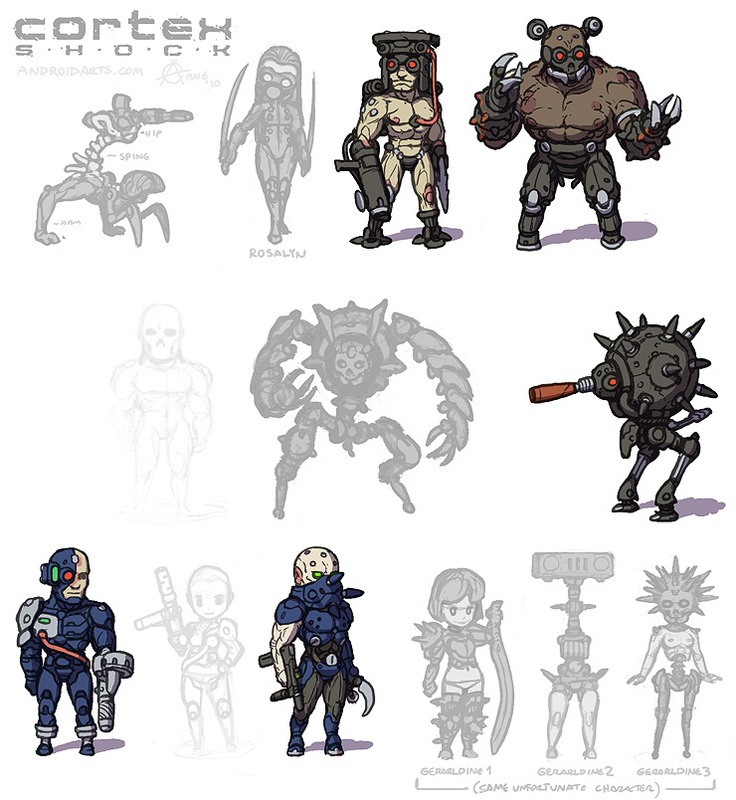 System Shock inspiration: Elite Cyborg, Mutated Cyborg, Cyborg Drone, MidWife. Generation 3 - Are these the final form, or just an elite? 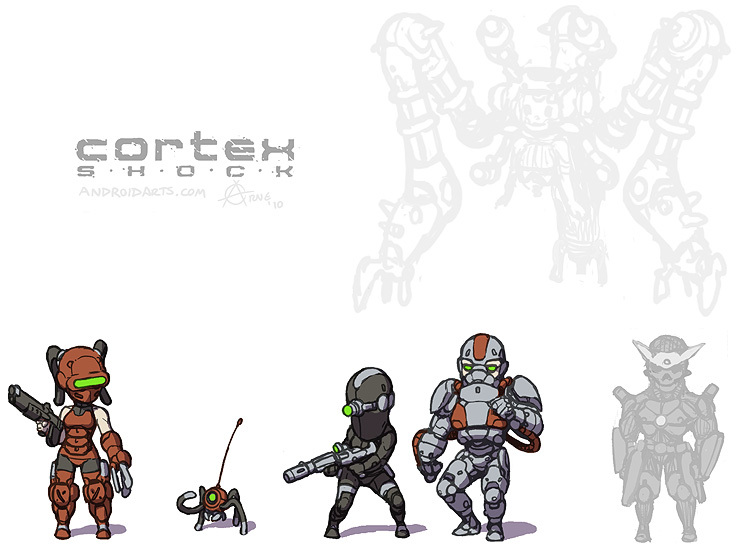 System Shock inspiration: Cortex Reaver, Cyborg Enforcer, Cyborg Assassin, Cyborg Warrior, 'Diego'. Perhaps there is an onboard Zoo. The Zero G mutant could be some poor creature, maybe human, which turns into a mighty morphin' balloon. System Shock inspiration: Gorillatiger (Baboon here though), Zero G mutant, Plant mutant, Avian mutant. Apparently, things started to go wrong when the AI secretly gained access to the onboard vat arrays (bio generation chambers), producing monstrosities which attacked the crew. In the fights, the vat arrays were destroyed. Next, the robotic bodies aboard started acting oddly, even the high level security units. On top of this, the brain vaults, where the crew's brains were located, lost power. This forced the crew to mount their biological bodies. It finally became clear to the crew that the AI was responsible, but before they could act, the AI gained control of most of the ship/station, locking the crew out of vital systems. On top of this, the AI had managed to create a terrible virus in an attempt to purge (or bio-form) the crew. Half of the crew was infected, and soon turned into aggressive monstrosities. The AI continued to refine her creations, carrying out sinister biological and cybernetic experiments. Soon, the remaining crew was either eliminated or captured. Back to the present. Early on, there are only smaller service robots attacking you. Eventually, you will exit the medical facility and perhaps be killed. This is where the twist to the generic memory loss setup is presented. You weren't human. Two AI's were created, and you're actually the twin of the evil AI. As such, you can control different bodies, so it didn't matter that your human meat puppet died. This explains how you can re-spawn, and why you have no memory (you were just booted up by some of the last survivors). Now you will have to disrupt the logistics of your evil twin (or not) before it puts its plan into action. You'll have to find weapons and bodies (extra lives). Perhaps some dumb CPU allies can take control of bodies not being used by you (with difficulty, since the AI has probably already hijacked most robotic bodies). Ultimately, you must shut down the production facilities, ship engines, and other systems to prevent the evil AI from invading a significant core world. The game would take place on a space station or space ship (like in Event Horizon). The map could be made out of shuffled rooms. 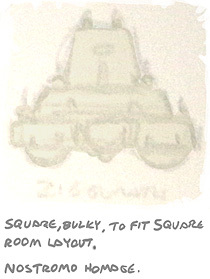 Certain rooms and corridors might have to be structured in the same way every time, whilst other sections would be less sensitive to randomness. This would be a game where personal relations are important. You read peoples logs, then you find their bodies or encounter them as a cyborg. If they repeat phrases from their logs in an eerie voice, it would be extra creepy. People can be identified by looking at their clothing, finding details in PDAs, or scanning an RFID chip or something. 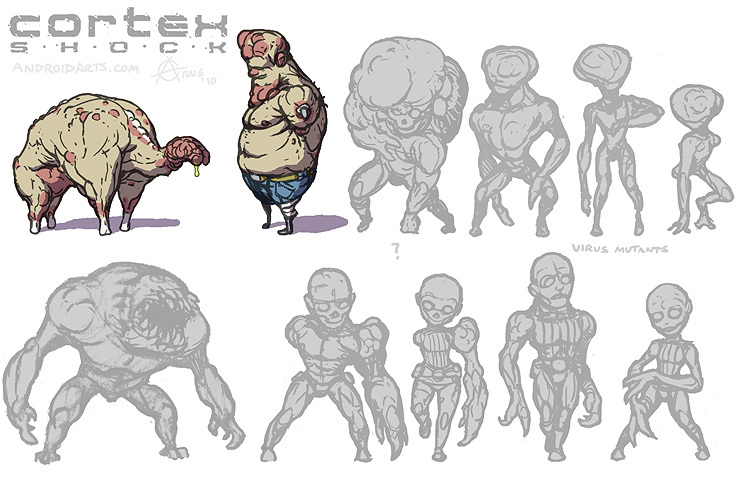 Some NPCs are special characters which always have a set story, whilst other are grunts with a short generated story. A grunt can for example write short log entires about hat they do, where they left something, or make observations about other grunts, special characters or big events. Special characters have longer log entries (always suffering the same fate) and are mentioned more often by grunts, and offer better clues to puzzles. They also have special models. So, at start, a number of characters are created (the entire crew). They are assigned to a region and given certain items, etc. On top of this, certain events are also generated. For example, one event can be six character barricading themselves in a room, before being overrun by monsters. Six characters would be used for this, and appropriate log strings would be put in their PDAs. The event would also require a physical location on the map to be populated. Of course, by the time the player reaches a location, it may have been disturbed or looted. Some events take place before hell broke loose. For example, when one of the special characters causes a ruckus, it will make some grunts comment on it in their logs. It is really the events which scatters content and log comments about. It might seem daunting to make a story system like this, but I prefer it for two reasons. Writing a good live dialog system is much harder, and I don't like story interfering too much with my sandbox endeavors. There could be some live story segments, but I would prefer them to work a bit like the story in Star Control II, i.e. small separate quests which I can tackle in almost any order. I really enjoy the early part of Exile (BBC micro game) because the first large caves have a lot of different puzzles to solve in parallel, and there are also alternative solutions. It's a bit of a playground. That's something for me to keep in mind. I also like how there are quite few enemies in Exile, which makes encounters much more meaningful and exciting than random shooting and swooshing until the bad enemy stuff on the screen goes away. I like the idea of the empire of the antagonist working a bit like an organism, with organs that perform certain tasks. It has to eat and tries to grow. You can kill it in many ways, but it's also capable of self repair. I think a game environment designed like this would be interesting to be in. Nowadays, it's certainly possible to persistently simulate the activities of everyone in a playfield the size of System Shock's. There would have to be organs (rooms) which perform various tasks, with the monsters moving about like blood cells and macrophages. Often when a game refers to a location, like "the hydroponics bay", it confuses me because I don't know if I've been there or how to identify it when I see it. There might be text on a wall or some visual clue, but it's easy to miss those things. Color code references would be more direct, and it would make memorizing locations easier. E.g. "Professor Clinton has barricaded herself in Brown Area." I'm just starting to play this game, and here are my impressions. Lots of things to find, like crew logs, redundant copies of items, items with obscure use. This buffer of peripheral content makes the setting more believable in the sense that it's less player centric. The crew logs add a lot to the atmosphere, making encounters personal. Corpses seem to be permanent (unless destroyed). Since you revisit some areas often, this adds to the solidity of the setting and creates meaningful landmarks. While there are levels, keys and doors, the game seems to be more open than most modern games, which at least is something. You can actually disable the plot (this includes keys and doors), enabling you to roam about freely, playing the game more like a shooter. However, then you miss out on the delightful little logs and remarks by Shodan. Enemies seem to have sensible weaknesses. Robots can't be hurt by the tranquilizer, but take damage from emp weapons. There are a limited amount of weapons available. It's pretty fun when you're forced to work with what you got. There are lots of little details, like a media device which you can play mini games on, and it even has a screen saver which kicks in. Too many blinking wall lights. This makes important consoles and buttons hard to spot. It's not very fun to look for hidden buttons that opens a door somewhere else. It's too abstract. Also, since I can't interact with most of the consoles, I feel a bit left out, and confused. I was going to say that the map is too large, but the real problem is that it's too abstract, and this makes it seem larger than it is. "You are in a maze of twisty little passages, all alike." Finding my way around would be easier if there was some kind of coherent structure. System Shock is not an abstract arena shooter like Quake 3, so it cold benefit from some realistic environments. Note that this doesn't mean monotonous white hospital corridors everywhere. Granted, overall the different levels have certain graphical and architectural themes, but a level by itself can be pretty confusing. Enemies respawn out of nowhere. If I understand it, each level has a reinforcement buffer with certain enemies. At any rate, enemies appearing out of nowhere kills immersion a bit for me. Too many enemies, or too evenly distributed. Shooting a guy or two every 20 meters makes the encounters feel less suspenseful. A high amount of identical enemies also makes them feel 'cloned', which breaks immersion. I'm not going to comment much on the dated controls or graphics.